Our product design is always based on the latest MS Office products to allow you a quick start. In addition to modern looks, intuitive operation is of particular importance to us. At the same time, we support all of the current operating systems from Windows 7 to 10. Our core competency is the development of IT solutions for logistics and planning within various industries. With CarLo, you get the right solution for efficiently planning, controlling and tracking your transports. From the calculation of quotes and order management through to transport planning, freight billing and statistical evaluations. Optimise scheduling of your vehicles and carriers and create tours based on economic factors. Numerous assistants and restriction checks support the dispatchers‘ daily work thanks to statuses for appointments, vehicle utilisation – e.g. volume, weight or store places – contribution margins for tours, remaining driving times of your drivers, or mixed loading prohibitions. The Order Management area allows you to quickly record your freight information or conveniently import these data using an interface. Offers and order templates can also be conveniently managed. Powerful billing tools support you in determining prices for your invoices and credit notes. Regardless of whether you simply work with flat rates or complex tariff tables – and if you want to, you can even fully automate this process. which data and functions are available to a user. In addition, you can easily manage all relevant settings centrally. 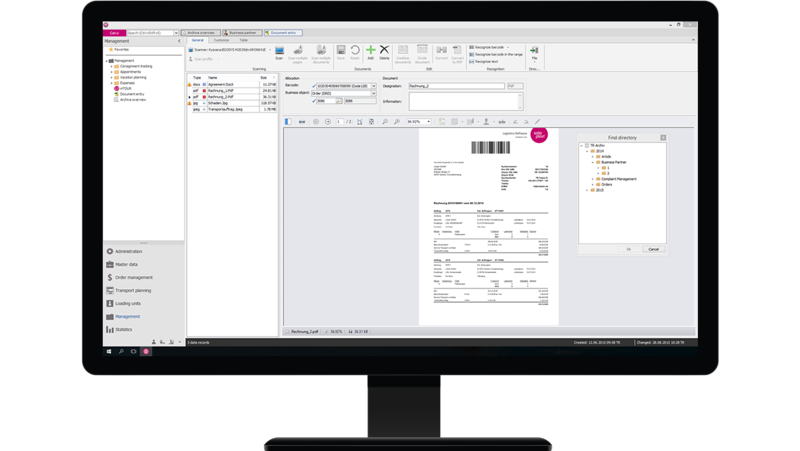 Use CarLo to create all relevant freight documents and invoices. All documents are adapted to your needs and printed, e-mailed or transferred by interface – whichever you prefer. Moreover, we gladly integrate your FinAcc system. Extensive evaluations and statistics as well as flexible data visualisation tools with integrated Cockpit functionality help you analyse a large variety of areas. Your ideal document management solution to complete CarLo: say goodbye to long searches in unstructured archives. Further optimise your workflow with the optional integration of one of the many commercially available document scanners and multi-function devices. The tool’s diverse functionalities range up to audit-proof archiving. Please note that audit-proof archiving also requires audit-proof hardware. Enter your orders online and track your consignments – 24 hours a day. Your end customers can enter and release transport orders, independently of office hours or specific staff members. Take a look at your warehouse online and view your current stock balance. 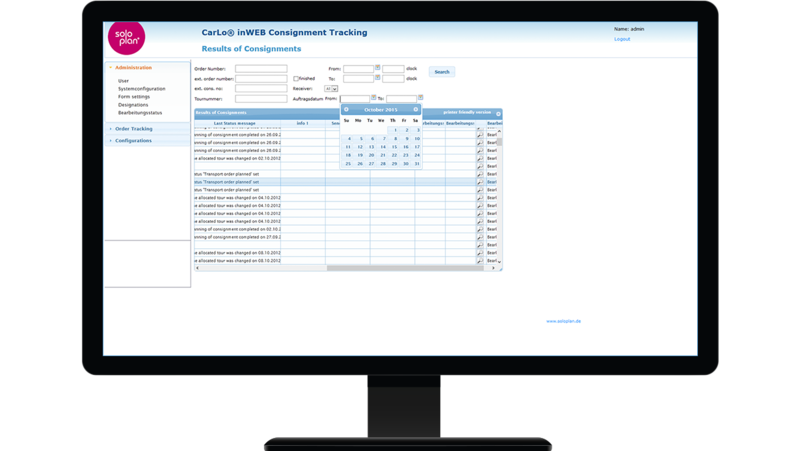 Enable your partners to check the locations of their consignments and to view their individual statuses at any time. Corresponding user accounts can be generated automatically. Graphical transport planning with a resource usage plan, restriction checks and fully automated event notifications for delays, etc.